How do I edit my project's sharing and privacy settings? 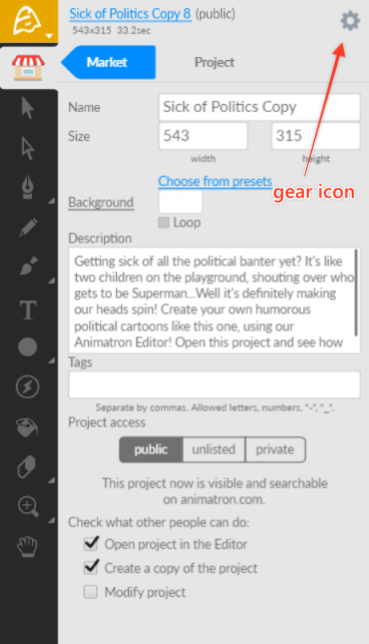 To access your Sharing and Privacy Settings: first, you must navigate to the Settings window by clicking on the gear icon, found along the top edge of the Editor, in the Project Header. The default privacy setting for new projects is “Public (read-only)”. “Public”, meaning access to your project will be public and anyone can see it in our Public Gallery and open it via the Editor. However, “(read-only)” means that no one can directly edit it unless they make a duplicate copy for themselves. Privacy Settings: Using the drop-down field at the top of the window, you can choose between 3 settings. Sharing Options: Using the appropriate checkboxes next to the selections below your Privacy Settings, you can choose to check ON any of 3 of the following options.